Savory-good with a pleasurable amount of crunch, you're going to love this classic Thai dish. To make it the authentic way, the recipe calls for lemongrass; however, if you can't find it, lemon zest makes a handy substitution. 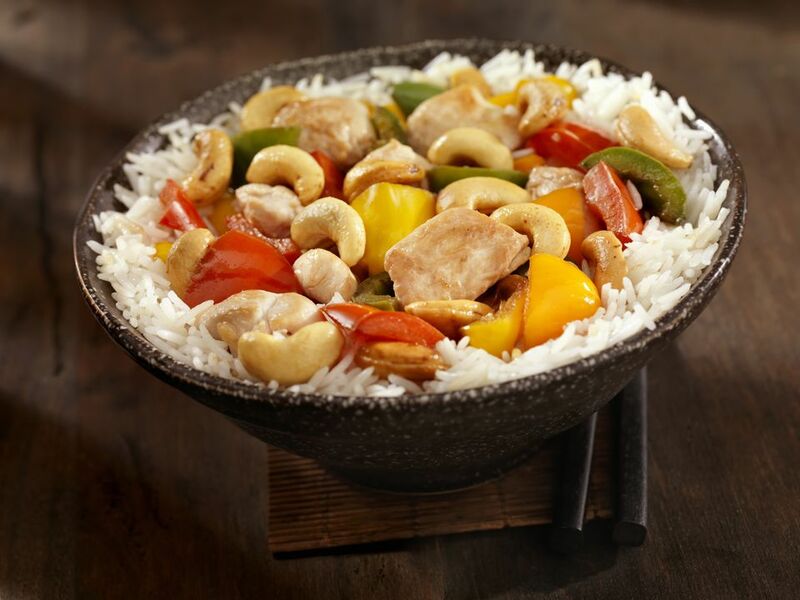 Cashew Chicken is one of many stir-fry recipes that came to Thailand via the Chinese. Very popular in Thai restaurants all around the world, this dish is also simple to make at home with impressive results - just follow the easy steps below to a meal that will be popular with all members of the family including the kids (just omit the chili for them). Accompany with Thai jasmine-scented rice or Thai Coconut Rice for a true Thai dinner treat. Stir together Marinade ingredients in a medium-size bowl. Add chicken pieces and stir to coat. Set aside. Combine all Stir-Fry Sauce ingredients in a bowl or large cup, stirring well to dissolve sugar. Set aside. In a large wok or frying pan, fry the onion, green onion, garlic, ginger, chili, and minced lemongrass in oil over medium-high heat (2 minutes). Add marinated chicken plus mushrooms. Stir-fry until chicken is cooked (3-5 minutes). When your pan becomes dry, add a little of the wine, 1-2 Tbsp. at a time. Add bok choy and continue stir-frying until it softens and turns bright green (2 minutes). Finally, add the sauce you made earlier, plus the cashews. Continuing stirring until everything is well combined and cooked to your liking. Do a taste test for salt and sweetness, adding more sugar if too sour for your taste, or more fish sauce if not salty or flavorful enough (the sauce should taste tangy and a little sweet). Serve with Thai Jasmine Rice or Thai Coconut Rice. Enjoy!